A calling, not a job. 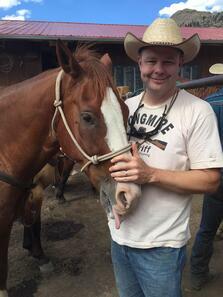 I recently returned from a week in the mountains of Colorado at a “dude ranch” called Lost Valley. Actually the preferred term for places like this is “guest ranch” and my family has been going there for years. It’s in the middle of the Pike National Forest about 90 minutes SW of Denver and there’s pretty much no cellular service and extremely limited internet. It’s a great place to go and unwind and spend time with family. One of the things that is really special about Lost Valley is their horseback riding program. They have a remuda of almost 150 horses and provide guided horseback rides for a variety of skill levels. Whether it’s your first time riding a horse or you are an advanced rider, guests receive personalized attention and instruction from qualified wranglers. A couple of very interesting things happened to me while I was at the ranch that I thought I’d share. First, I got a chance to work on horses again. As you can imagine, with an operation of this size there are always horses that need attention for minor wounds, eye infections, hoof problems and other lameness issues. I was able to help the wranglers care for their horses and showed them a few tricks I picked up from my time as an equine veterinarian, even though that was 20 years ago. I guess some things are harder to forget than others, and evaluating a lame horse is one of them! Second, I got a chance to see the looks in the eyes of teenagers and young adults who were interested in this fantastic profession. When the word got out that there was a veterinarian at the ranch and that he was going to be looking at some horses, the parents of 3 young people approached me and asked if their child, who wanted to be a veterinarian, could tag along. Of course I said yes and I was grateful for their help, frankly. When you’re working on a horse in the field without a Mayo stand, for example, it helps to have a lot of hands! After the work was done, the kids and their parents were effusively thankful to me for letting them tag along. I explained to them that the reason I am where I am today is because other veterinarians took ME under their wings when I was a teenager….I’m just paying it forward. Third, I was reminded that those of us who work in the veterinary profession, whether as veterinarians or technicians or client service representatives, are lucky to play a role in building the ancient and sacred human/animal bond. Horses are graceful and magnificent animals. Ancient hominids first allowed canines near their caves and fireplaces tens of thousands of years ago and since then the magical bond between us has only grown. Those of us who are fortunate enough to be able to make a living working with animals are truly blessed, and I’m grateful for experiences like Lost Valley to remind me that being a veterinarian isn’t just what I do...it’s who I am. Has something like this ever happened to you before?